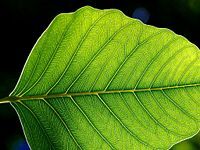 In botany, a leaf is an above-ground plant organ specialized for photosynthesis. 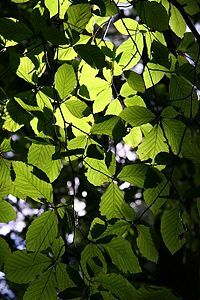 For this purpose, a leaf is typically flat (laminar) and thin, to expose the chloroplast-containing cells (chlorenchyma tissue) to light over a broad area, and to allow light to penetrate fully into the tissues. Leaves are also the sites in most plants where respiration (use of oxygen or the production of carbon dioxide), transpiration (passage of water vapor through the pore or membrane of the leaf), and guttation (oozing of water from the leaves resulting from root pressure) take place. Just as the xylem and phloem of a plant's vascular system has been compared to the vein and arteries of the human circulatory system, leaves have been compared to human lungs, with both involved in the exchange of gases with the outside environment. In Western religions, this reflects the theological concept of humans as a microcosm of creation (Burns 2006). 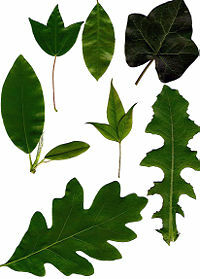 Leaves can store food and water, and are modified in some plants for other purposes. The comparable structures of ferns are correctly referred to as fronds. A structurally complete leaf of an angiosperm consists of a petiole (leaf stem), a lamina (leaf blade), and stipules (small processes located to either side of the base of the petiole). The point at which the petiole attaches to the stem is called the leaf axil. Not every species produces leaves with all of these structural parts. In some species, paired stipules are not obvious or are absent altogether; a petiole may be absent; or the blade may not be laminar (flattened). The tremendous variety shown in leaf structure (anatomy) from species to species is presented in detail below. The epidermis is covered with pores called stomata (singular, stoma), part of a stoma complex consisting of a pore surrounded on each side by chloroplast-containing guard cells, and two to four subsidiary cells that lack chloroplasts. 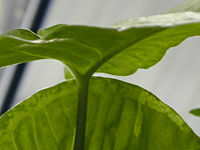 The stoma complex regulates the exchange of gases and water vapor between the outside air and the interior of the leaf. Typically, the stomata are more numerous over the abaxial (lower) epidermis than the (adaxial) upper epidermis. Most of the interior of the leaf between the upper and lower layers of epidermis is a parenchyma (ground tissue) or chlorenchyma tissue called the mesophyll (middle leaf). This "assimilation tissue" is the primary location of photosynthesis in the plant. The products of photosynthesis are called assimilates. These two different layers of the mesophyll are absent in many aquatic and marsh plants. An epidermis and a mesophyll may be lacking. Instead, for their gaseous exchanges, they use a homogeneous aerenchyma (thin-walled cells separated by large gas-filled spaces). Their stomata are situated at the upper surface. Leaves in temperate, boreal, and seasonally dry zones may be seasonally deciduous (falling off or dying for the inclement season). This mechanism to shed leaves is called abscission. After the leaf is shed, a leaf scar develops on the twig. In cold autumns they sometimes turn yellow, bright orange or red as various accessory pigments (carotenoids and anthocyanins) are revealed when the tree responds to cold and reduced sunlight by curtailing chlorophyll production. The veins are the vascular tissue of the leaf and are located in the spongy layer of the mesophyll. They are typical examples of pattern formation through ramification. The xylem typically lies over the phloem. Both are embedded in a dense parenchyma tissue (= ground tissue), called pith, with usually some structural collenchyma tissue present. External leaf characteristics (such as shape, margin, hairs, etc.) 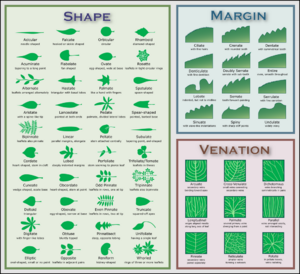 are important for identifying plant species, and botanists have developed a rich terminology for describing leaf characteristics. These structures are a part of what makes leaves determinant; they grow and achieve a specific pattern and shape, then stop. Other plant parts like stems or roots are non-determinant, and will continue to grow as long as they have the resources to do so. 135° (or 3/8): eight leaves in three gyres. 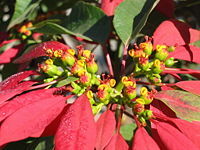 Whorled — three or more leaves attach at each point or node on the stem. As with opposite leaves, successive whorls may or may not be decussate, rotated by half the angle between the leaves in the whorl (i.e., successive whorls of three rotated 60°, whorls of four rotated 45°, etc). Note: opposite leaves may appear whorled near the tip of the stem. Rosulate — leaves form a rosette ( = a cluster of leaves growing in crowded circles from a common center). Two basic forms of leaves can be described considering the way the blade is divided. A simple leaf has an undivided blade. However, the leaf shape may be one of lobes, but the gaps between lobes do not reach to the main vein. A compound leaf has a fully subdivided blade, each leaflet of the blade separated along a main or secondary vein. Because each leaflet can appear to be a "simple leaf," it is important to recognize where the petiole occurs to identify a compound leaf. Compound leaves are a characteristic of some families of higher plants, such as the Fabaceae. Sessile or clasping leaves do not have a petiole. In sessile leaves the blade attaches directly to the stem. In clasping leaves, the blade partially or wholly surrounds the stem, giving the impression that the shoot grows through the leaf such as in Claytonia perfoliata of the purslane family (Portulacaceae). A stipule, present on the leaves of many dicotyledons, is an appendage on each side at the base of the petiole, resembling a small leaf. They may be lasting and not be shed (a stipulate leaf, such as in roses and beans); or be shed as the leaf expands, leaving a stipule scar on the twig (an exstipulate leaf). The situation, arrangement, and structure of the stipules is called the stipulation. There are two subtypes of venation, craspedodromus (the major veins stretch up to the margin of the leaf) and camptodromous (major veins come close to the margin, but bend before they get to it). Feather-veined, reticulate: the veins arise pinnately from a single mid-vein and subdivide into veinlets. These, in turn, form a complicated network. This type of venation is typical for dicotyledons. Pinnate-netted, penniribbed, penninerved, penniveined; the leaf has usually one main vein (called the mid-vein), with veinlets, smaller veins branching off laterally, usually somewhat parallel to each other; e.g. Malus (apples). Parallel-veined, parallel-ribbed, parallel-nerved, penniparallel: veins run parallel most the length of the leaf, from the base to the apex. Commissural veins (small veins) connect the major parallel veins. Typical for most monocotyledons, such as Poaceae (grasses). 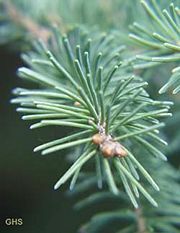 Dichotomous: There are no dominant bundles, with the veins forking regularly by pairs; found in Ginkgo and some pteridophytes. Leaves can show several degrees of hairiness. The meaning of several of the following terms can overlap. Leaves rustle to move humidity away from the surface reducing the boundary layer resistance between the leaf and the air. Burns, C. P. E. 2006. Altruism in nature as manifestation of divine energia. Zygon 41(1): 125-137. This page was last modified on 3 April 2008, at 22:21.